You can’t survive without a liver. It detoxifies your blood and makes essential nutrients, among other vital functions. You can get by with a small fraction of your liver, but if that goes, you’re as good as dead. This is especially bad news for over 240 million people around the world whose livers are chronically infected with hepatitis B virus (HBV). Left unchecked, the virus can lead to fatal complications like cirrhosis and liver cancer. More than 780,000 people die from HBV-related liver disease each year. Scientists know that disease results from the way HBV interacts with the immune system, but they don’t understand how this happens. 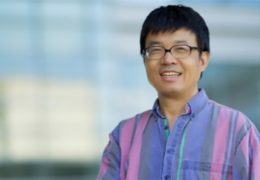 Fortunately, UNC immunologist Lishan Su and his colleagues now have a new mouse model that lets them study exactly how HBV hijacks the immune system, and it may soon expand the number of available HBV drugs. U.S. researchers have largely ignored HBV compared to other major blood-borne viruses, Su says. One reason is that it’s been a long time since HBV was a big problem in the United States. In the era after World War II, army scientists and civilian doctors noted higher rates of liver disease in patients after surgeries and blood transfusions. Once they learned how to detect the virus, they altered their medical protocols to dramatically decrease the risk of spreading HBV. Then, safe and effective HBV vaccines became available in the 1980s. But these preventive measures aren’t worth much to people who are already infected with HBV. That’s why Su’s mouse model is so important for global health. According to the World Health Organization, in many regions including China, Southeast Asia, and Sub-Saharan Africa, more than 8 percent of the population carry the virus, even though they might not show symptoms. In these regions, infection rates resist change because the virus is passed from parent to child before the child can be vaccinated. Taiwan has shown that a strategy using both the vaccine and an anti-HBV therapy could block mother-to-child transmission, but this kind of effort is costly and requires strong health-care infrastructure. Su and other researchers want to see how they can develop new and improved medicines to help people who are already infected with HBV. To get into a cell, HBV uses certain receptors that are only in human cells. Imagine a pattern on the surface of the virus as a key that only works on a specific lock: a particular receptor on the surface of human liver cells. The virus can’t enter the cell unless it fits the lock. Su gets around this problem by transplanting newborn, immunodeficient mice with human stem cells that mature into functional liver tissue and circulating immune cells within the mouse. The stem cells are transplanted into the mice in a manner similar to how people receive blood transfusions, just on a smaller scale: picture a single syringe of cells rather than a half-liter bag. Over time, the human stem cells differentiate, meaning they transform and mature inside the mouse to become specific functional tissues. It may sound simple, but getting to this stage of HBV research has been a dream of Su’s for 25 years. Su grew up in China, where HBV is a major public health concern. He came to the United States for graduate studies in virology. As a postdoc, he studied hematopoietic stem cells, a cell population that can differentiate to form all the red and white blood cells that make up the circulating immune system. While at SyStemix, a biotech company, Su and his colleagues used humanized mice to study HIV. They transplanted human hematopoietic stem cells and human thymus into mice, which became human immune systems inside the mice. “At the time, you could only humanize the immune system—and for HIV, that’s all you need,” Su says. In contrast to HIV, a mouse model of viral hepatitis must have human immune cells and human liver cells. Su left SyStemix to join UNC in 1996. 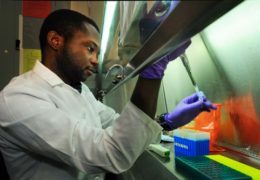 He focused on developing humanized mice and other models to study HIV and immunity, but for the last 10 years, his lab has been working on hepatitis viruses and the liver. The lab started moving towards the HBV model when they took on another viral liver pathogen, hepatitis C virus (HCV). HBV and HCV both infect the liver and cause hepatitis, but the features that drugs can target—their structures and life cycles—are different. The early 2000s saw a rise in HCV among people receiving highly active anti-retroviral therapy for HIV. People with HIV were living much longer, but there was an urgent need to study HIV/HCV coinfection. Su, along with graduate student Mike Washburn and postdoc Liguo Zhang, devised a strategy to do just that. As the lab had done with mouse models of HIV, Washburn transplanted human hematopoietic stem cells into immunodeficient mice to give them human immune systems. He also made genetic changes to the mice that allowed him to replace mouse liver cells with human liver cells. When Washburn and Zhang examined these mice two months after exposing them to HCV, they saw hallmarks that let them know they had a working model of HCV infection. Su, Washburn, and Zhang have since filed a patent for these genetically modified mice through UNC’s Office of Technology Development. Moses Bility. Photo by Donn Young. The new HBV mouse model builds on the lab’s HCV model. In the final year of the HCV project, Moses Bility joined the lab as a postdoc. He knew lots about the liver and had an idea how he might improve the HCV model. “If you open a new research field, everyone benefits,” Bility says. Bility removed the mouse liver cells by injecting the mice with an antibody. This process is easier than breeding genetically altered mice, and anyone who studies mice can access the antibody. Bility’s liver-cell replacement method worked. Once Bility and Su had HBV-infected mice, they could start asking the questions that are likely to lead to new HBV therapies. How does HBV affect the immune system? Which immune cells are involved in the infection process? What kind of drug might intervene? They found a population of immune cells that were turning healthy liver cells into scar tissue through a process called fibrosis—an early phase of cirrhosis, which renders the liver nonfunctional. The fibrosis-promoting immune cells were a kind of macrophage, a cell best known for its Pac-Man-like behavior. Macrophages gobble up pathogens and other undesirables, but they also send out signals telling other immune cells to “come join the party” or “stay home.” Immunologists call the “stay home” signal immune suppression because it blocks immune activities that would get rid of a viral infection. The macrophage population that expanded during HBV infection was both promoting fibrosis and sending out a “stay home” signal, which meant the macrophages were making the liver a cozy space for the virus to reside. Cells with these properties have been seen in other diseases and are called M2 macrophages. When Bility’s collaborators looked at liver biopsies from people with HBV, they also found elevated levels of M2 macrophages. Taken together, this evidence suggests that M2 macrophages are a new potential therapeutic target for disrupting HBV infection. Su is quick to point out that people have been studying macrophages and cancer for a long time, meaning that the lessons already learned from studying M2 cells in cancer may accelerate the development of HBV therapies. Bility is now testing different drugs in his humanized mice to see which ones can reduce HBV infection. “It’s an exciting time to be working in HBV research,” Su says. He’s looking forward to seeing where the new mouse model will lead. We don’t yet have a new anti-HBV drug, but Su’s group has reached a crucial first milestone in its effort to block HBV’s fatal impact. Lishan Su is a professor in the Department of Microbiology and Immunology. He is a member of UNC’s Lineberger Comprehensive Cancer Center and the Institute for Global Health and Infectious Diseases. 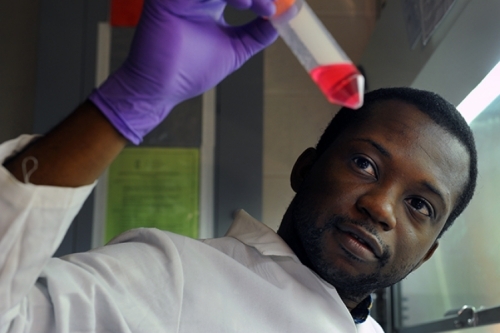 Moses Bility is a postdoctoral research associate in the Department of Microbiology and Immunology. Michael Washburn completed his degree in the Curriculum in Genetics and Molecular Biology in 2010. Liguo Zhang is now the principal investigator of the Laboratory of Infection and Immunity at the Institute of Biophysics, a division of the Chinese Academy of Sciences in Beijing, China. Ginnie Hench earned her doctorate from UNC’s Department of Microbiology and Immunology in the School of Medicine before working as a postdoc in the Department of Biology in the College of Arts and Sciences and as director of UNC’s HHMI Future Scientists and Clinicians fellowship program with the Office for Undergraduate Research. She is now an undergraduate lab supervisor in the Department of Chemistry in the College of Arts and Sciences. The research received funding from the National Institutes of Health, including the National Institute of Allergy and Infectious Diseases, the National Cancer Institute, the National Institute on Alcohol Abuse and Alcoholism, and the National Institute of Diabetes and Digestive and Kidney Diseases. The HCV mouse model was published in Gastroenterology in 2011. The HBV mouse model was published in PLOS Pathogens in March of 2014.